I’m a big fan of Portuguese wines, so I was excited when Christy from Confessions of a Culinary Diva suggested that we focus on Portugal for our Wine Pairing Weekend this month. Portugal offers good tasting wines at a great price, made from a variety of native grapes that you don’t typically find elsewhere. Definitely a lot to like about wine from Portugal! The meal I served up for the Portuguese #winePW took a lot of twists and turns in my head before making its way to our plates. I love Portuguese kale soup, and featured my version of the classic dish in my Collards & Kale Cookbook. I had the idea of cooking up some of the kale soup ingredients, but in a different format. My first thought was to cook some pork and kale up together in a skillet dish. I got home from work the night I planned to make my Portuguese wine dish, and it was a beautiful summer evening that just had to include grilling. 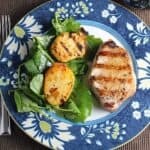 So I decided to make my Heaven Sent Grilled Pork Chops for our protein, with a few twists. I added coriander to my cumin garlic spice rub, as I read that the spice is very common in Portuguese cooking. I used boneless chops this time, which take right around 5 minutes per side to grill up nice and moist. The new recipe I came up with for this #winePW is the Portuguese Potatoes with Kale. I perused a few sites with info on Portuguese food to get a sense of typical spice for Portuguese cooking, and put several of those together in a spice blend for the potatoes: saffron, paprika and coriander. I like to parboil the potatoes before grilling. Most recipes call for just 6 minutes of boiling potatoes before grilling, but I find closer to 10 gets the potatoes to the desired tenderness. Grilling the potatoes is then really just a matter of putting on the finishing touches. 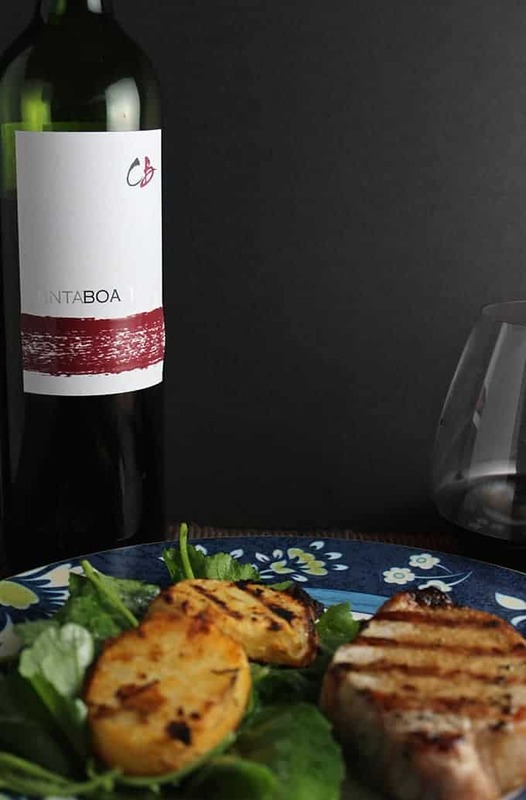 Wine Pairing: I grabbed a bottle of the 2012 Tinta Boa ($11) red wine blend. The wine is made in Southern Portugal, and is a blend of native grapes Tinta Roriz and Touriga Nacional. The nose had the aroma of a forest floor. The first taste was quite tannic; that edge softened a bit in the glass. I got blackberry and licorice taste. It is a medium bodied wine. This was a decent pairing for the pork and Portuguese potatoes, but I can’t say I was that impressed with this bottle of wine. I believe I’ve had it before from an earlier vintage and liked it better. Not sure if it was the vintage difference or just this bottle. It was the only red Portuguese wine I could find in the shop for this meal; I’ve had some other red wines from the Dao and Duoro regions for a similar price point that I really enjoyed. So I will keep my eye out for a chance to blog about another Portuguese wine so I can really extol its virtues. Meanwhile, perhaps this review will help keep the Portuguese wine prices nice and affordable! 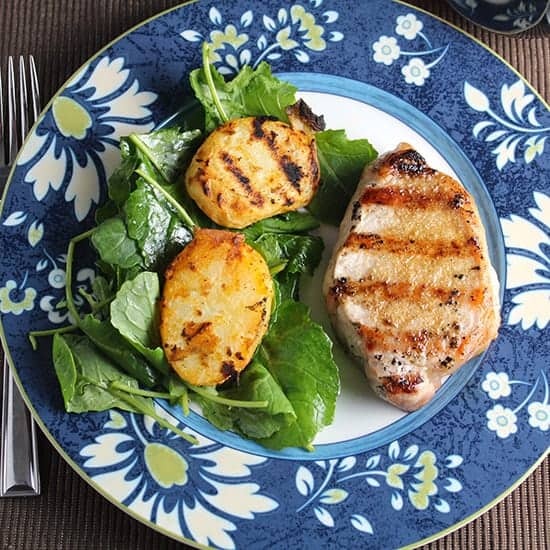 Potatoes coated with a Portuguese spice blend are grilled and served on a bed of baby kale with a Maple Vinaigrette. Great side for grilled pork. Prep the kale: combine 2 tablespoons of the olive oil with the maple syrup and cider vinegar. Add salt and pepper to taste. Toss the kale with the vinaigrette in a large bowl, and set aside. Make the spice blend: combine 3 tablespoons olive oil with the paprika, garlic, coriander and salt. Boil water for the potatoes. Add the potatoes, and boil until they are just beginning to get soft, 8 to 10 minutes. Drain the potatoes when ready, and rinse with cold water. When the potatoes are well-drained, place them in a large bowl. Gradually pour in the spice mixture. and gently move the potatoes around in the bowl so all the potato pieces are coated with the mixture. Preheat a grill to medium high. Carefully place the potato slices on the grill. Grill for about 5 minutes on one side, then carefully turn to grill for another 5 minutes. The potatoes should be cooked through and getting some nice grill marks. Remove the potatoes from the grill and place on a platter. Plate the kale, filling about 1/2 of a plate. Place a couple potatoes on top of the kale, and serve your protein alongside the potatoes and kale. 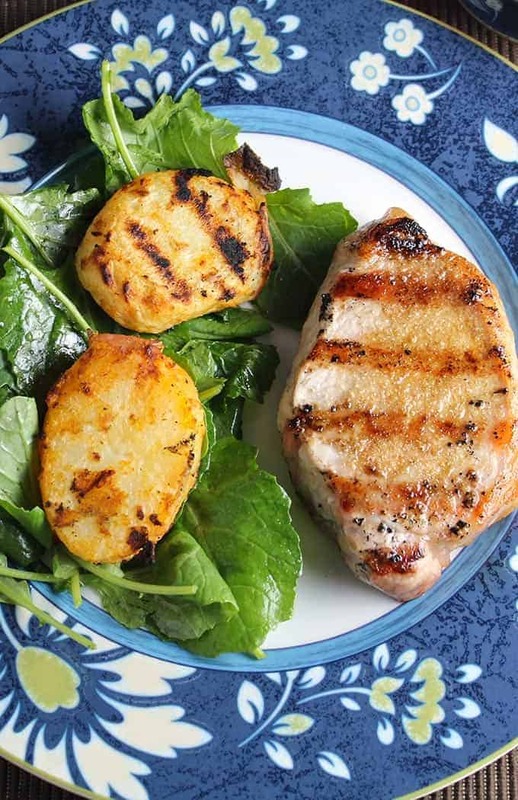 Enjoy the potatoes and kale together along with your meat. Be sure to check out all these tasty Portuguese pairings! If you get to this post in time, join us for a live Twitter Chat at 11 a.m. on Saturday, August 8, using the hashtag #winePW. Join us next month for “Volcanic Wines”, hosted by Camilla of Culinary Adventures with Camilla. Check out all of the upcoming and past Wine Pairing Weekend events here. Your plate looks delicious. I am glad you had previous good luck with wines from Portugal so that you weren’t turned off from them. yes, I guess this wouldn’t have been the best intro to wines from Portugal! The food looks great, David. I really need to try your pork chop rub! Too bad the red wasn’t up to par, but I appreciate your honesty; they’re not all winners. I’m always amazed how you can come up with such tasty, healthy recipes ! Sorry the wine didn’t work out – I had a few of those with Sardinia. Thanks for starting this group – it has become such a great part of my weekends and wine enjoyment! Thanks for being an active member, and hosting this one, Christy! Great meal David! Perfect wine pairing. Thanks for the recipe! Great looking dish David. I’ve not done pork on the grill before (well other than ribs). Looks like your turned out great. I always appreciate your healthy and delicious dishes! As always another scrumptious looking healthy meal. You can definitely do delicious and healthy. Coriander in the rub, and maple vinaigrette, I was drooling as I was reading. Fantastic post. I would love to come and eat by you, when can I come?!LOL! We will have to get a #winePW dinner party together soon! Love the idea of grilling the potatoes. The spice mixture sounds delicious. Great pairing and the wine sounds like the perfect choice. The flavors in your meal sounds amazing! That’s too bad the wine didn’t live up to your hopes. But at least you had a nice meal!